Heat a large sauté pan or casserole dish until medium hot. Add the olive oil, onions, carrots and celery and cook over a medium heat for 5 minutes. You want them to soften but not colour – you can put a lid onto the pan to help keep the moisture in and steam the vegetables at the same time. Add the thyme and garlic and cook for another minute then add the tomato purée and turn the heat up. Stir well so that the tomato purée goes all through the vegetables then add the Puy lentils and mix once more. Tip in the tinned tomatoes and the vegetable stock, stir well and bring to the boil. 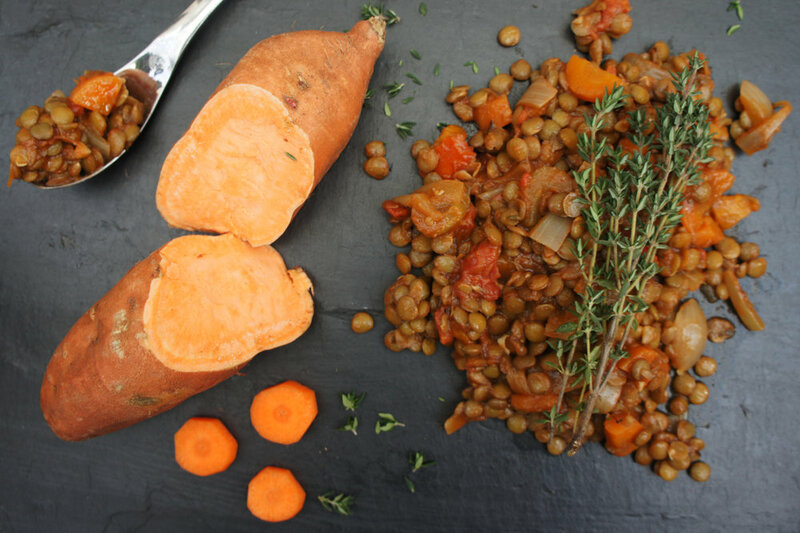 Turn the heat down to a gentle simmer and cook for 20-25 minutes until the lentils are tender and the sauce reduced slightly. Add the balsamic vinegar and season with salt and pepper. Serve with pasta of choice, or over a baked sweet potato with side salad.